How to Download Classes from Craftsy.com for Offline Viewing on Mac/Win? Easy to watch Craftsy classes offline on PC, Android and iOS phone or tablets. View classes without internet connection. Craftsy delivers crafts education, like jewellery making, paper crafts, painting, photography, cake decorating, gardening and more. All the high-definition video classes from Craftsy.com are delivered by experienced craft teachers and more than 4 new classes are produced each month. On Craftsy.com, anyone can grow love into something that can be shared and be proud of. However, like many other online streaming video services, Craftsy classes are available online only. If you prefer to download Craftsy videos for playback offline, a third-party online video downloader is necessary. 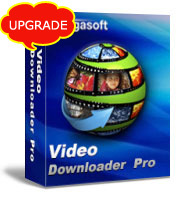 Bigasoft Video Downloader Pro brings the best solution for you. Acting as an ideal Craftsy Video Downloader, Bigasoft Video Downloader Pro is capable of downloading and converting high-definition video classes from Craftsy.com to iPad, iPhone, Android phone or tablets and more. Download and convert Craftsy videos to any format in one click. Craftsy to MP4, AVI, MOV, MKV, WebM, FLV, VOB, etc. Extract audio from Craftsy classes to MP3, M4A, WMA, 3GA, AAC, AC3, etc. Similar popular training video sites are supported, including Digital Tutors, Lynda, YouTube, Coursera, Pluralsight, etc. Download and convert Craftsy videos to profiles for iPad, iPhone, Apple TV, Android phone, tablets and other media devices. Reconvert downloaded classes or any other local media files with build-in media converter. Below is a detailed guide on how to download Craftsy classes and it could be extend to other video sharing websites. How to download videos from Craftsy.com? Firstly, download and install the ideal Craftsy Video Downloader. With this all-in-one video downloader tool, you are able to download any of your favorite videos in one click. There are two different versions for Windows and Mac users separately. And the two versions are fully compatible with the latest OS. Go to the Craftsy.com page and copy the URL of the class you wish to download and playback offline. Then turn to the Download panel of Bigasoft Video downloader, and it will paste the copied URL of Craftsy video to the URL box. Click "Save Folder" button to choose the destination folder for the downloaded Craftsy classes. Click the "Download" button to start downloading and converting Craftsy videos. If you have purchased the classes, a window will pop up to let you enter user ID and password to log in. From Activity panel, you can check the downloading process. After a few minutes, the Craftsy classes will be downloaded and converted to destination path. Would like to download videos from Craftsy.com or other sites? Just download Bigasoft Video Downloader Pro to try!